This is probably the most missed cause of back pain and sciatica that we have seen in our PT clinic. Why? Because it's frequently missed on an MRI or X-ray. Back pain and sciatica sufferers with a problem in their SI joint or pelvis usually have trouble rolling over in bed, getting in and out of a car, walking up and down stairs for long periods, driving, crossng one leg over the other or getting dressed. Many will frequently report sharp pain shooting into their groin. Some may even have problems controlling their bladder and may experience "leakage". Sexual activity can be painful. SI Joint and Pelvic problem sufferers can have pain, numbness, and tingling and heaviness into the leg as well. They might say things like, "One leg feels heavier than the other." Most report the pain is more of a "broad ache" down the outside of their thigh and leg that wraps around. And ages? Well, this is where it gets a bit tricky. 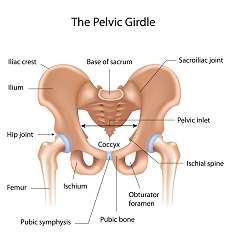 With SI Joint and Pelvic Issues, we've seen 15 year old dancers to 23 year old NFL football players to 37 year old mothers of three to 84 year old retired construction workers who've had this. Just realize it's common - And if you've suffered with back pain and sciatica and have tried treatments which did not work for you, then there's a good chance you could have an underlying SI joint and pelvic problem. If you look at a stack of blocks on a table, what's the most important block? The top block? If you move the top block, does it affect the other blocks below? What about the block on bottom? If you move the block on the bottom, the entire stack comes tumbling down. All because you took away the foundation of the stack of blocks. Your back works the same way. The foundation for the bones in your spine is your pelvis. There are 3 bones and 3 joints in the pelvis. The joint in front is called the "Pubic Symphysis". The two joints on either side of the tailbone are called "Sacroiliac Joints" or "SI Joints" for short. The 3 joints need to be moving and need to be stable for you to move without any pain and get back to normal.